Optoelectronics has become an important part of our lives. Wherever light is used to transmit information, tiny semiconductor devices are needed to transfer electrical current into optical signals and vice versa. Examples include light emitting diodes in radios and other appliances, photodetectors in elevator doors and digital cameras, and laser diodes that transmit phone calls through glass fibers. Such optoelectronic devices take advantage of sophisticated interactions between electrons and light. Nanometer scale semiconductor structures are often at the heart of modern optoelectronic devices. Their shrinking size and increasing complexity make computer simulation an important tool to design better devices that meet ever rising perfomance requirements. The current need to apply advanced design software in optoelectronics follows the trend observed in the 1980's with simulation software for silicon devices. Today, software for technology computer-aided design (TCAD) and electronic design automation (EDA) represents a fundamental part of the silicon industry. In optoelectronics, advanced commercial device software has emerged recently and it is expected to play an increasingly important role in the near future. 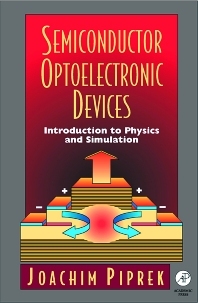 This book will enable students, device engineers, and researchers to more effectively use advanced design software in optoelectronics. The intended audience are students, engineers and scientists who need to design and analyze advanced optoelectronic devices. Many of them are members of organizations like IEEE-LEOS, OSA, SPIE, and APS. Joachim Piprek received his Ph.D. in solid state physics from Humboldt University Berlin, Germany. For more than 15 years, he has been conducting research on simulation, design, and analysis of optoelectronic devices, both in industry and academia. Dr. Piprek has authored more than 100 journal and conference publications and he has taught graduate courses at universities in Germany, Sweden, and in the United States. Currently, he is an Adjunct Associate Professor at the University of California at Santa Barbara. Dr. Piprek chairs the annnual international conference 'Numerical Simulation of Semiconductor Optoelectronic Devices' (NUSOD). He also serves as guest editor for leading technical journals and gives short courses on optoelectronic device simulation at universities and companies worldwide. Professor for the Electrical and Computer Engineering Department at the University of California at Santa Barbara, California. Authored more than 100 journal and conference publications and has taught graduate courses at universities in Germany, Sweden, and in the U.S.